As I started to leave, I saw a door open up at the attached Nicholas Pavilion, and it was announced they setup large projection screens with a closed-circuit feed of the Kohl Center. I figured it was better than heading to a bar to watch it there (where many people turned to go to). 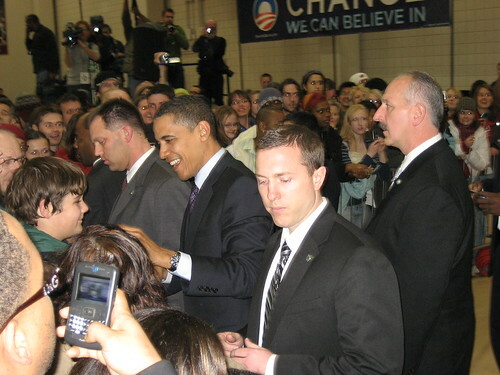 As we waited for Obama to start speaking, I noticed a significant increase in secret service agents... checking doors, walking around with their finger to their ear... I knew he was going to cut through to get to the Kohl Center. And sure enough he did-- he even walked up on a platform to say a a few words for a couple minutes. His mini-speech was good... very personable and sincere. Following that, he walked up to the crowd and shook some hands. Including mine! 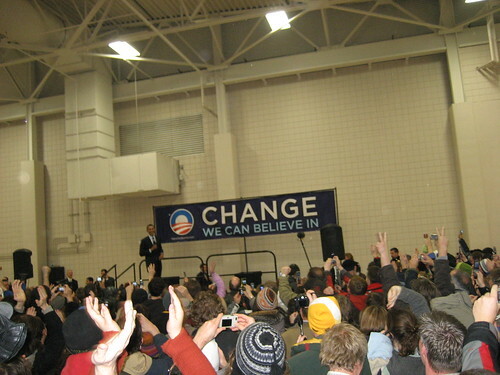 He then left the pavilion to go on to his real speech in the Kohl Center as we watched on the large projection screens. He got me pretty excited in the pavilion, but then his speech let me down. I don't know... after his "surprise" visit to those who weren't fortunate enough to get a seat in the Kohl Center... his main speech just seemed so recited and fake. From the angle that our closed-circuit camera was at, as he wavered in his speech, you could see his eyes go to the teleprompter to read what he was going to say next. Half way though people in the Pavilion were visually bored and restless. And $4,000 from the government for college expenses for doing some community service? I might have mis-heard him, but it just doesn't seem feasible with the debt our government is in. I'm still torn between the two Democratic nominees, and was disappointed I wasn't "wow"ed. Four years ago Ralph Nader came to speak, and his speech was significantly more heart-felt and impressive, even prompting me to stand up and clap. I just didn't feel that tonight. I know how you feel. I wish I would have been able to go last night, but I think my reaction would have been similar to yours. For whatever reason, I just can't seem to catch Obama fever. So... Teleprompters were affirmative. Bummer -- I know that wasn't what you were looking for.